Every day, 10,000 people in this country turn 65 – that’s more than 400 every hour! What does this mean for health and health care? 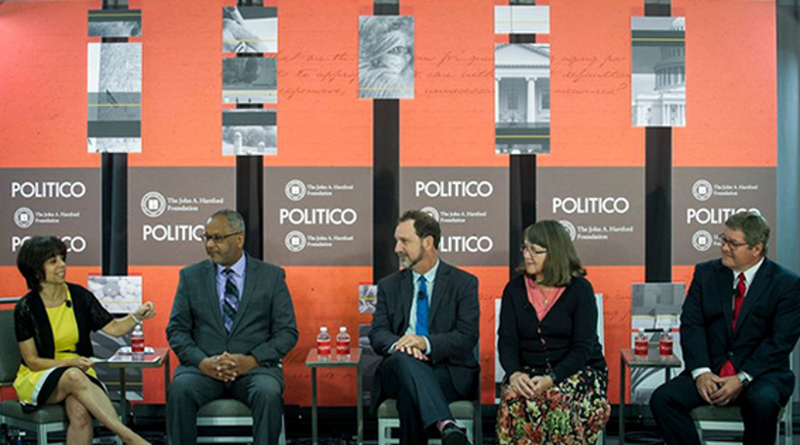 That’s the conversation that Politico Live convened recently in Washington D.C., bringing together national thought leaders from a range of different backgrounds and disciplines to explore what aging in America looks like. [You can watch a video of the event.] Politico also issued a new special report, “The Agenda: Aging in America” that takes a comprehensive deep dive into the biggest barriers to improving the care of older adults, from transportation challenges to the stress experienced by family caregivers to regulatory red tape hindering hospices. Terry Fulmer, president of The John A. Hartford Foundation, which sponsored this event, opened up the conversation by reminding us that despite the huge demographic surge in Americans over age 65, our current health care systems too often do not align with the needs of older adults and their families. It’s not just that the demographic wave of baby boomers is getting old, but that they’re living longer than any previous generation in U.S. history. While that’s a good thing, those extra years often are accompanied by worsening complex health conditions – chronic ailments like Alzheimer’s Disease, diabetes and heart disease that progressively disrupt and hinder a person’s quality of life, but aren’t immediately life-threatening or fatal. Treating such ailments is an expensive long-term process capable of bankrupting even older adults with sizable retirement savings. Costly long-term services and supports and other social services are essential for meeting their care needs, sometimes over the course of many years. Despite this unmistakable and growing demographic challenge, the federal government has failed to build a community-based, long-term care system capable of meeting older adults’ needs. The lack of affordable housing, the chronic shortage of home care workers and a waiting list for Meals on Wheels are just some of the gaps in services. On the financial side, only around seven million people in the U.S. have private long-term care insurance; Medicare does not cover long-term care and only those who qualify based on very low income can access Medicaid-covered Long-Term Services and Supports. That leaves a huge gap in coverage for millions of the baby boom generation who will face long-term health problems over the coming decades. What can be done? Despite all the problems and gaps, the forum did highlight bright spots of organizations and health care leaders who are pushing forward with innovative ideas and ways to address these problems. There was the president of an Akron/Canton Ohio-based Area Agency on Aging who discussed their work in developing new service areas and business lines through public/private partnerships to coordinate care and link social with medical services. Dr. Michael Fratkin, President and Founder of ResolutionCare, located in a rural community in Northern California, brings care to people in their homes including at the end of life. This truly person-centered model of care is successfully using video conferencing technology and collaborating with area health plans. In addition, the last panel of speakers addressed how Choosing Wisely and palliative care programs are promoting conversations between physicians and patients around planning for the care they want when dealing with serious or chronic illness. These bright spots are to be applauded and emulated, but most of the presenters agreed that much more must be done, and with urgency, if we are going to redesign health systems that can adequately care for our aging population.